Haven’t got the A-level results you needed? Don’t worry, this is your opportunity to accelerate your education pathway into a lifelong career in IT. University is not the only route to your chosen career. IT apprenticeships offer an alternative pathway which will help you leap frog your peers as they trundle off to do a three year degree. So if you didn't get the A-level results you needed, don't bother with UCAS clearing. Find out why failing your a-levels and choosing a Firebrand IT apprenticeship is the best thing that could have happened to you. 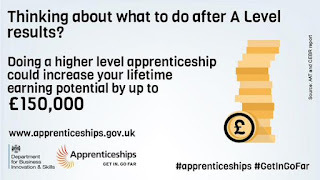 During your IT apprenticeship you’ll be paid a starting salary up to £18,000. Upon completing your apprenticeship, starting salaries are typically around £20,000 – with a salary rise of around £3500 a year after that. Whilst a typical University degree runs over three years, your Firebrand Apprenticeship runs for two years. You’ll get the skills and qualifications you need 33% faster than your peers. Plus, with 99% of Firebrand Apprentices ending up in full-time employment following their apprenticeship, you’ll be 3 years into your career by the time your peers are finishing University looking for their first job. Best of all, no student debt! You are not just on a training course. This is a real job, with real a business. You will learn business critical skills, and gain years’ worth of real work experience. Did I mention we find the job for you? No need to trawl through job boards of the local papers. Just give us your details and we’ll match you to an IT job near you. While your peers are off racking up £1000s worth of university debt, you’ll working in your chosen career, earning a wage and developing skills that will form the foundation of a successful future. Firebrand Apprenticeships are aligned to the requirements of the IT industry. You’ll train and earn industry recognised qualifications that are in demand by businesses throughout Europe. Plus, apprenticeships are funded by the Government and your employer. This means you could get up to £27,000 worth of training for free.